Trespasser from Alterna Comics is a genuine thrill for its restraint and pacing. It's a slow-burn of a tale that relies on great storytelling as though it was a lazy river that calmly floated you along with relative ease. Now imagine that same river stocked with alligators then you'll surely get the shock of your life when one snaps at one of your meandering limbs hanging over the lip of your tiny boat. Trespasser continues to build the suspense as the consequences of Hector's actions from issue one come home to roost. In this reality built by Justin M. Ryan and Kristian Rossi, Hector and his daughter have survived an unspecified cataclysmic event, leaving them on their own and isolated in a remote home in the woods. A strange alien visitor became dinner and now there may be some side effects. Blisters aren't the only troublesome result as another alien lurks in the shadows. The beauty of 'Trespasser' is the deliberate storytelling. Ryan is in no hurry to drop a huge exposition bomb in the middle of the issue. We don't know what happened in the world to create this presumably post-apocalyptic life but it doesn't matter. What does matter is the character development, establishing a tone and a setting that seems normal but becomes increasingly tense and suspenseful. Aiding in the atmospheric world building is Rossi's wonderfully clean and fluid art. The wide angle shots emphasize the vastness of their location, the loneliness of their situation, and the lack of hope around them. As the tension builds with some familiar but effective scary story tropes, the panels seem to get smaller, clausterphobic and terrifying. Rossi knows how to press the reader's buttons. With all that said, I still have a ton of questions. What happened to the world? Why can't they just go into town for supplies? Is the alien they ate giving Hector blisters? What does the new alien want? What's up his daughter's eye? 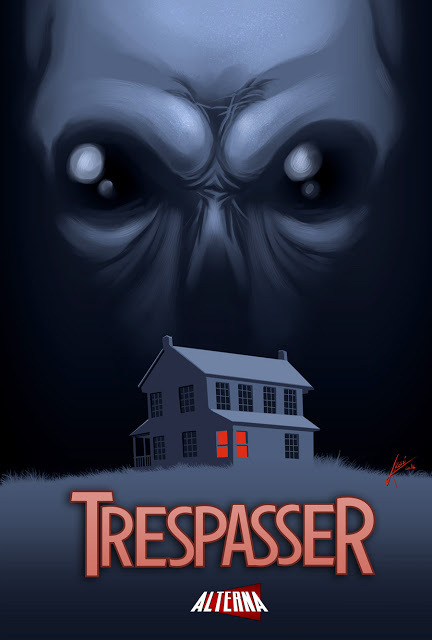 It's this desire to know more while being completely petrified that makes 'Trespasser' a cleverly paced suspense story.